Across the Emerald Empire, the greatest servants of the Emperor make their homes in ancient castles, elaborate courts, impregnable fortresses, venerable dojo, and majestic palaces. Some exist in the wilds of the Empire, while others mark the center of great, sprawling cities. Some are centers of trade and artistry, while others exist far from any other sign of civilization. And yet, despite their many differences, it is in the heart of each of these bold strongholds that the heart of the samurai dwells. 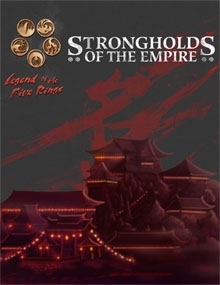 Strongholds of the Empire is available in PDF and Print exclusively at DriveThruRPG.com!